Among the new clothes and shiny supplies that signal it’s time for your kids to go back to school is another important consideration: what will you pack in their lunch sack that will not only be healthy, but that they’ll actually eat? Look no further than the following foods, many of which are Non GMO, organic and completely kid friendly. There’s even a treat or two in there for mom and dad. Bringing lunch isn’t just for the grade school set, right? I’ve been looking for an organic granola bar for some time now, so I was delighted to sample 18 Rabbits’ line of nut-free, kid-friendly bars (so was my 3-year-old son, Charlie, who devoured them in a matter of days). 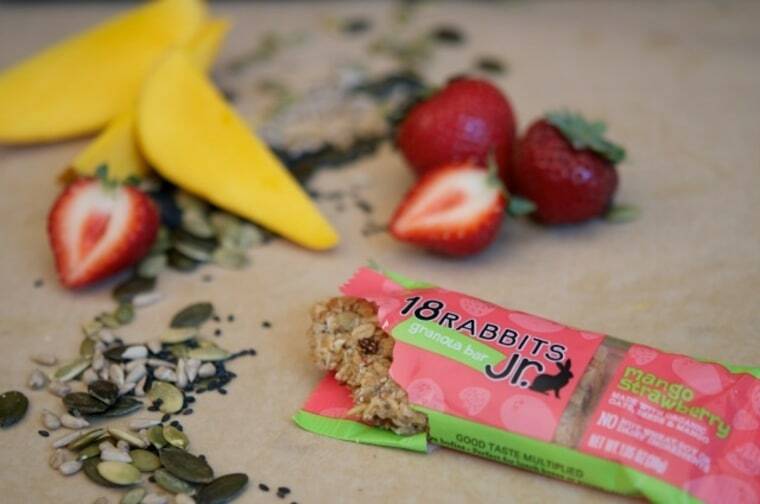 Not only are the bars Non GMO, but 18 Rabbits uses ingredients from responsible, sustainable sources and they donate 1 percent of the bars they make to programs that serve kids affected by food insecurity. Available in four flavors: Mango Strawberry, Cranberry Apricot, Chocolate Cherry and Chocolate Banana. These all-natural nut butters—available in unique flavors like maple almond and chocolate hazelnut, as well as good old-fashioned peanut—are made from a handful of ingredients (as in four) and contain sustainably sourced natural palm fruit oil. Bonus: in addition to jars, the nut butters also come in sustainable squeeze packs, perfect for lunch boxes! These nut-free snack packs are school safe, nutritious, oh, and completely and totally satisfying for both kids and adults. Loaded with dried fruits, a variety of seeds, and mini chocolate chips (in the Mountain Mambo version) they’re also Non GMO Project Verified and free of common allergens like peanut, soy, casein, tree nut and gluten. Available in Beach Bash and Mountain Mambo. You’ll feel much better about packing chips in your child’s lunch box if they contain a serving of veggies. Enter The Better Chip -- bold, colorful masa corn chips with a healthy dose of spinach, kale and beets in every bite. Oh and since they’re totally delicious, Non GMO Project Verified and gluten-free, we won’t blame you for sneaking a bag into your lunch too. Available in snack size bags in Fresh Corn and Sea Salt, Jalapeños and Sea Salt, Spinach and Kale and Sea Salt, Beet and Sea Salt and Chipotles and Sea Salt. I put these cookies out for a recent play date and could barely keep up with the demand from little hands! Not only are they gluten-free, but they’re super flavorful and made without any artificial ingredients (or GMOs.) Available in four flavors: Mission Fig, Strawberry & Fig, Blueberry & Fig and Raspberry & Fig. Perfect for pre-schoolers, these Greek yogurt pouches are packed with superfoods like kale and quinoa, with kiwi, pomegranate and strawberry thrown in for a dose of sweetness. Available in five blends: kale, strawberry and amaranth, purple carrot, blackberry and quinoa, spinach, kiwi and barley, pumpkin, pomegranate and quinoa and sweet potato, blueberry and millet. Possibly the best organic, Non GMO, gluten-free cookie on the market, these mini versions of the company’s fabulous bites— available in lunchbox-friendly snack packs— are most certainly a treat. It is a happy day indeed if these babies show up in your lunch sack. Available in chocolate chip oatmeal bliss, butter crisp love and chocolate chip love. Not only is their 100 percent whole wheat bread the first of its kind to be Non GMO Project verified and organic, but it also packs 4 grams of protein and 3 grams of fiber per slice. The texture is fantastic too. Check out their new Seeded Honey Wheat variety as well which contains 4 tablespoons of organic honey in every loaf. Bonus: the company has a great back story too: 1/3 of their 300 employees, including Dave himself, are ex-cons, and they’ve received multiple awards for their contribution to the Portland, Ore. community. OK, OK we know chocolate isn’t considered “healthy” but who can resist it anyway, especially when it’s Fair Trade Certified and Non GMO Project Verified? I ripped open the package and was astonished at how good these slivers of dark chocolate bark are. (As an 8 ½ months pregnant woman, I am putting these in the dream food category.) Forget your kids’ lunchbox—hide them in the pantry for your own mid-day pick me up! Available in Dark Chocolate Mint, Dark Chocolate Pretzel, Dark Chocolate Pumpkin Seed, Dark Chocolate Almond, Dark Chocolate Toasted Coconut With Almonds, Dark Chocolate Peppermint Pretzel, and Blueberry Quinoa with Agave. A spinoff of their Snackimals crackers (also an ideal lunchbox add-in), this organic cereal features the same animal shapes as the crackers and only seven grams of sugar per serving. Equally tasty with milk or without, they make an excellent on-the-go breakfast or lunchtime snack. Available in Vanilla Blast, Cinnamon Crunch and Chocolate Crisp.